The procedure is also sometimes referred to as an upper gastro-intestinal endoscopy. An endoscope has a light and a camera at one end. The camera sends images of the inside of your body to a television monitor to help your gastroenterologist diagnose common problems affecting the oesophagus (gullet), the stomach and parts of the small bowel. A gastroscopy is a very common procedure. It is test where a Gastroenterologist looks into the upper part of your gut (the upper gastrointestinal tract). 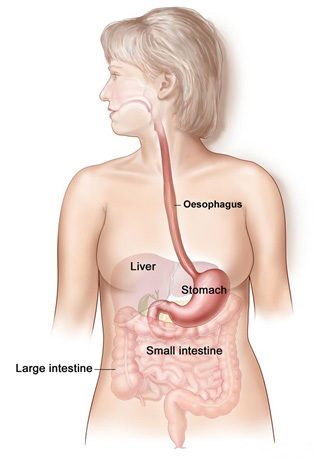 The upper gut consists of the oesophagus (gullet), stomach and duodenum. The operator uses an endoscope to look inside your gut. Therefore, the test is sometimes called endoscopy. 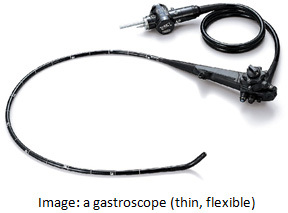 A gastroscope is a thin, flexible telescope. It is about as thick as a little finger. The endoscope is passed through the mouth, into the oesophagus and down towards the stomach and duodenum. The tip of the gastroscope contains a light and a tiny video camera so the operator can see inside your gut. The gastroscope also has a ‘side channel’ down which various instruments can pass. These can be manipulated by the doctor. For example, the doctor may take a small sample (biopsy) from the inside lining of the stomach by using a thin ‘grabbing’ instrument which is passed down a side channel. In Australia, patients undergoing gastroscopy will be sedated. Patients are therefore not in pain, and are not awake during the procedure. The procedure is usually done as a day-case patient in a specialised endoscopy centre. Oesophagitis (inflammation of the oesophagus). The gastroenterologist will see areas of redness on the lining of the oesophagus. A gastroscopy can take about 10-15 minutes. It’s usually carried out as a day procedure, which means that you won’t have to spend the night in hospital. The procedure is often carried out under sedation. You will be very drowsy and have little awareness about what’s happening. On admission, you’ll meet the nurse before the procedure and they’ll be able to answer any questions you have. You should remove any glasses, contact lenses and false teeth. Your anaesthetist and gastroenterologist will hold conversations with you before the procedure to go through your medical history and to answer any questions you may have. You will then be guided to go to the endoscopy suite, where the anaesthetist will insert the cannula so that sedative medicine can be given. A nurse will help you to lie on your left-hand side, and a small probe is attached to your finger. This measures your oxygen level and heart rate. You will be asked to bite on a small plastic mouthpiece to help keep your mouth open. This will also help to protect your teeth during the test. Dentures may have to be removed if they are loose. During the test you may be given oxygen through little prongs that fit just inside your nostrils. After being sedated, your gastroenterologist carrying out the procedure will place the endoscope in the back of your mouth. It will then be guided down your oesophagus and into your stomach. You should not eat for 6 hours before the test as the stomach needs to be empty. You will be sedated, and thus you will need somebody to take and accompany you home. Advice about medications which may need to be stopped before the test. The complete test takes approximately 10 minutes, but if treatments are carried out procedures do take longer. Most people are ready to go home after resting for an hour or so, enough time for the anaesthetic to wear off. You must not drive home or operate machinery for 24 hours after having the sedative. You will need somebody to accompany you home and to stay with you until the effects have fully worn off. Most people are able to resume normal activities the next morning. When your family or friend arrives to pick you up, your gastroenterologist will go through the findings and give you a report. A copy of the endoscopy report will also be sent to your family doctor. Depending on the results, your gastroenterologist will simply reassure you that there is no concerning findings; or if you need to see your Family Doctor; or to return to see your specialist if needed (you will need to make an appointment before you leave the endoscopy centre). You can make bookings, or for further information, please call our receptionist team on .